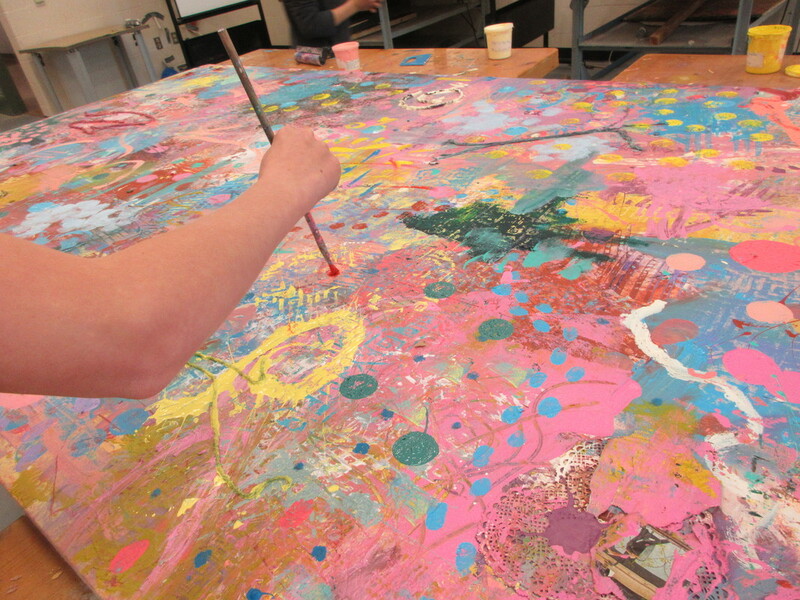 The piece "Painting Under Paper Cuts" was up for your vote in ArtPrize 9 to win the Youth Collaboration Award for $5000! This collaborative work of Art from the Byron Center West Middle School Visual Arts and STEM program asked students to use their creative minds to come together and create a piece in the midst of a week where many of them were completing State Testing. Students looked at and learned about the combines of Robert Rauschenberg and paper cuts and printmaking of Caledonia Curry before starting this work to help inform the large mixed-media collaborative. 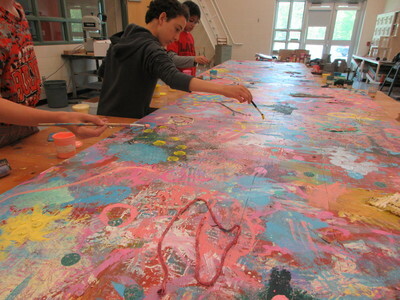 Students started by actively making their marks using colors of their choice and a variety of painting tools. Afterwards, students worked collaboratively to enlarge portraits onto paper and use paper cutting to create positive images by cutting out negative shapes. Students also worked in pairs to make bilaterally symmetrical and asymmetrical circle patterns with cut paper. 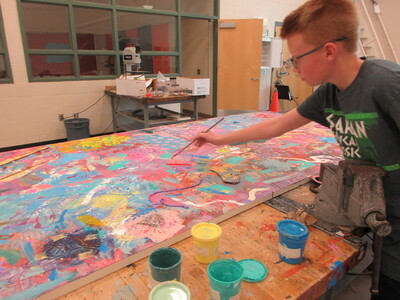 The end result is a colorful creative exploration that shows what can happen when students create together. This was also a great way to release creative energy during a week of testing. We did not win the $5000 Youth Collaboration prize, but we plan to enter again in 2018; if we win, we plan to purchase equipment for our Maker's Space to offer additional Visual Arts and STEM opportunities for students. If you would like to help our program in other ways, visit Mrs. Campbell's DonorsChoose page.